If there’s something you’d like to ask that isn’t covered here, please email us at sales@benchmaster.uk or call us on 01457 837146. 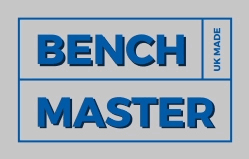 A: BenchMaster have been a leading UK manufacturer of workbenches for more than 40 years. The ready to use products are crafted and welded by our experienced and professional workforce who ensure customer unique needs are met. We offer a fantastic range of products to suit all needs at competitive prices. We target ourselves to deliver fully assembled products in approximately 10 working days and in most cases for no extra cost. Q: How to measure a workbench? Q: Does BenchMaster Limited have a brochure? A: Yes, we have an electronic version which you can downloaded from our website, or simply call us on 01457 837146 or email us at sales@benchmaster.uk and we will send out a printed version. Q: What are BenchMaster Limited opening hours? A: We are open Monday to Friday 8am – 5pm (excluding bank holidays) and closed Saturday and Sunday. Q: Do I get a receipt for goods purchased? A: If ordered via the website you will receive an acknowledgement of payment made and a VAT invoice will be e-mailed or sent in the post. Q: Do BenchMaster keep stock? A: BenchMaster do not keep stock as there are too many variations. Each order received is made to order, uniquely for the customer that ordered it. Q: Where is BenchMaster Limited located? A: BenchMaster Limited is based in a town called Mossley near Ashton-under-Lyne in the North West of England. In terms of warranty all our products are guaranteed against faulty manufacturer. (this is very rare) We offer a 2 year warranty subject to reasonable wear and tear. Q: I want to carry out welding work on a steel top workbench, is it possible to have a non-galvanised top? A: Yes. 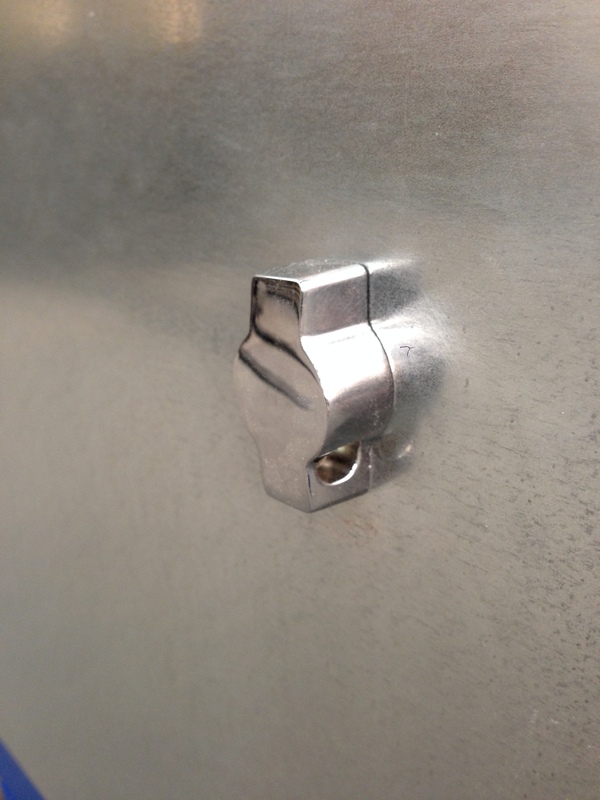 Our standard galvanised tops are made from 2mm galvanised steel sheet but if we are advised that the steel top will be used for welding, we fit a 3mm black steel top for the same price. We do of course need to be advised on the order. Q: What are the dimensions of the upper shelf? A: The dimensions of the upper shelf is the length of the workbench x 300mm deep and is located 300mm above the worktop. Q: If BenchMaster supply a vice does it come with the bolts to attach to the workbench? A: Yes. Please note for transport purposes vices are not fitted to the workbench but the holes are drilled in the worktop so the vice can be fitted following delivery. 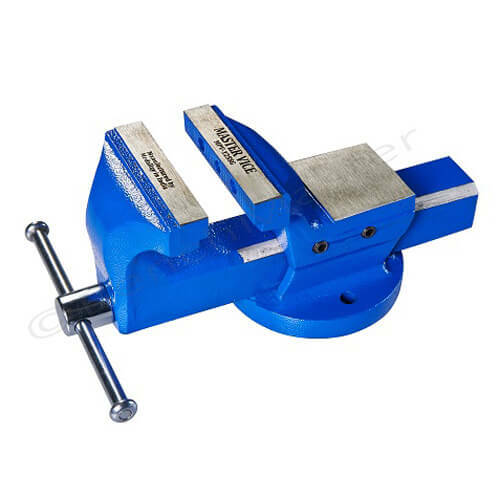 The vice is normally located in a cupboard or tied to the shelf. Q: What is the rear lip on the heavy and super heavy duty workbenches? A: It is a 40mm tall piece of galvanised steel at the back of the workbench to prevent stuff falling off the back of the workbench. If it’s not required it can be left off at no extra cost, but must be noted on the order. Q: What do you require with a fluorescent light fitting? A: You will require a light rail based on the length of the bench. Q: What are the sizes of the louvre and tool panels? A1: The louvre panels are 445mm high x 456mm wide. There are 8 locations points from top to bottom and 6 across the width. A2: The tool panels are 438mm high x 456mm wide. There are 12 square holes from top to bottom and 12 across the width. 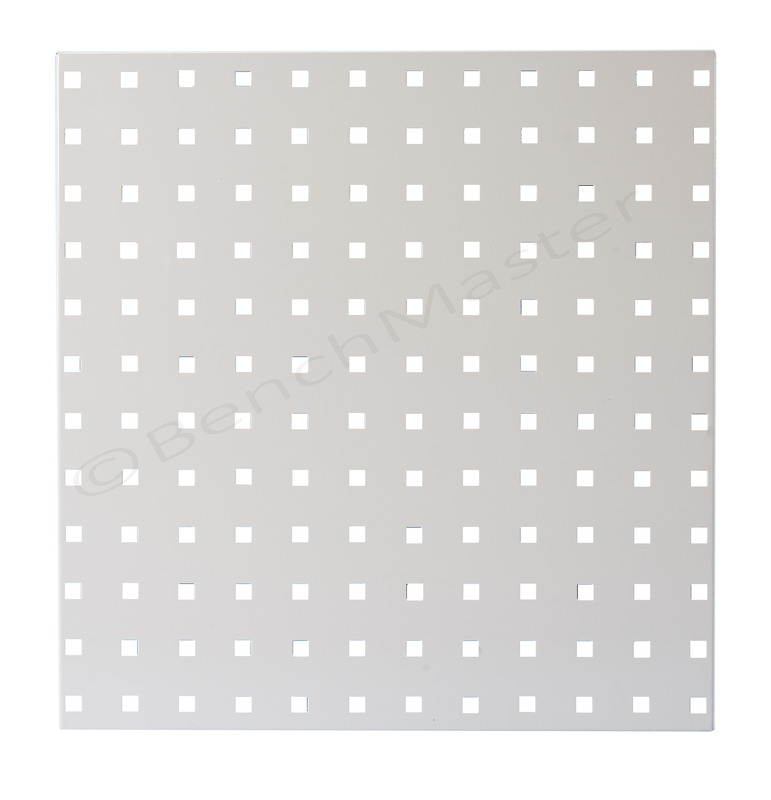 Each hole is 10 x 10mm square. Q: What is the size of the galvanised cupboards? 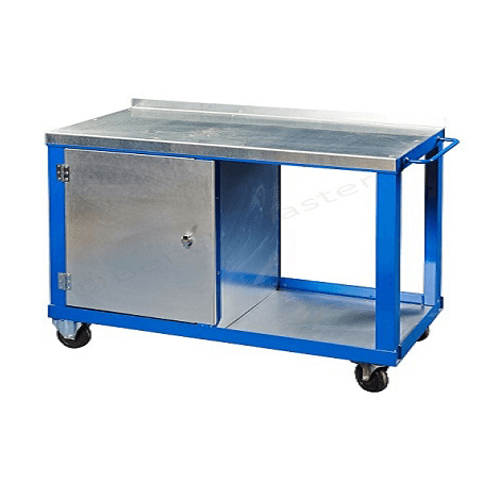 The galvanised cupboards measure 600mm x 600mm by the workbench depth. Q: What is the size of the galvanised drawers? A: The size of the galvanised drawer is 457mm x 460mm x 150mm. Q: What is the size of the island unit? Q: Do all standard steel cupboards and drawers come with a lockable door/drawer? A: All cupboards come with ‘cam’ type locking knob that clicks in position. The locking knob has a hole to allow the fitting of a padlock so cupboard/drawer can be fully locked. BenchMaster do not currently supply padlocks. Q: Do workbenches come with vice plates? A1: Not on the medium duty workbenches as it is unusual to use this workbench with a vice. 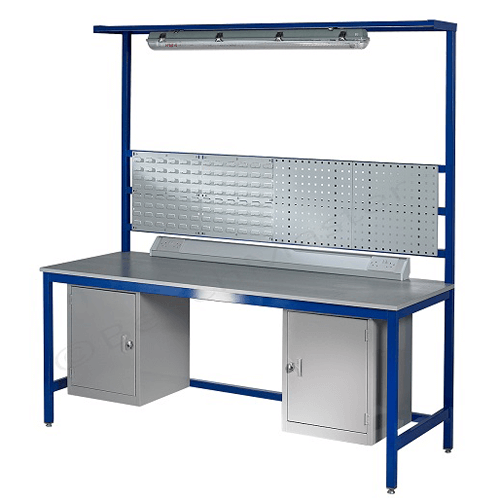 A2: Yes on all heavy and super heavy duty workbenches as standard. It is located in the steel frame on the front right hand side when looking at the front of the workbench. On request it can be located on the left hand side at no extra cost. 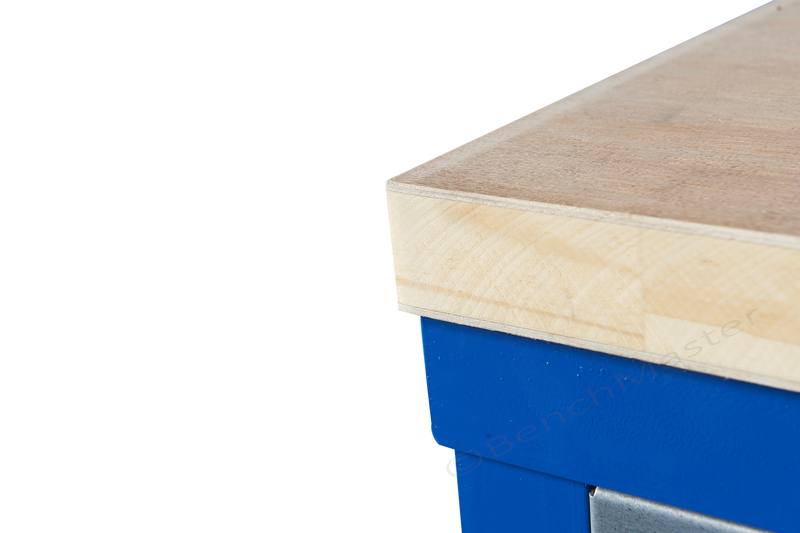 A3: The standard vice plate on the heavy and super heavy duty workbenches is 230mm x 110mm x 3mm. Q: Do the workbenches have levelling feet? A1: The medium duty workbenches have all metal levelling feet with approximately 20mm of adjustment on each leg. A2: The heavy and super heavy duty workbenches do not have levelling feet as standard but if this is required please ask and we will offer an extra price for supplying with all metal levelling feet. Q: What size of steel section is used on the stainless steel workbenches? 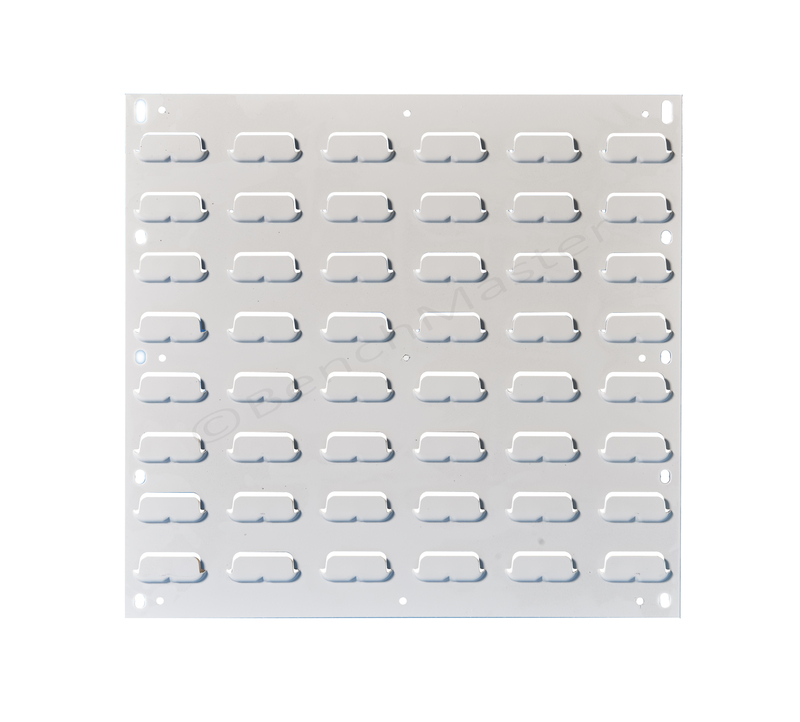 A: 40 x 40 box section that is 304 grade stainless steel. Q: What size of steel section is used on the heavy and extra heavy duty workbenches? 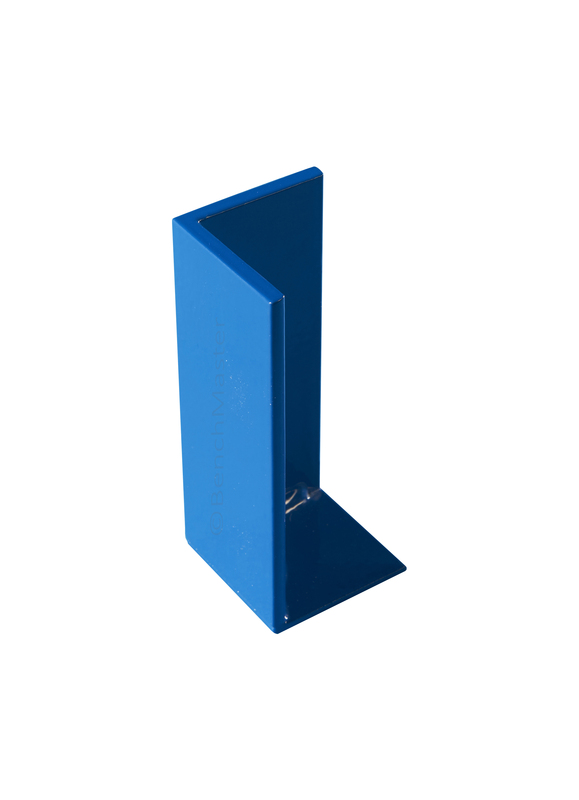 A: 50 x 50 x 5mm angle steel. Q: What size of steel section is used on the medium duty workbenches? 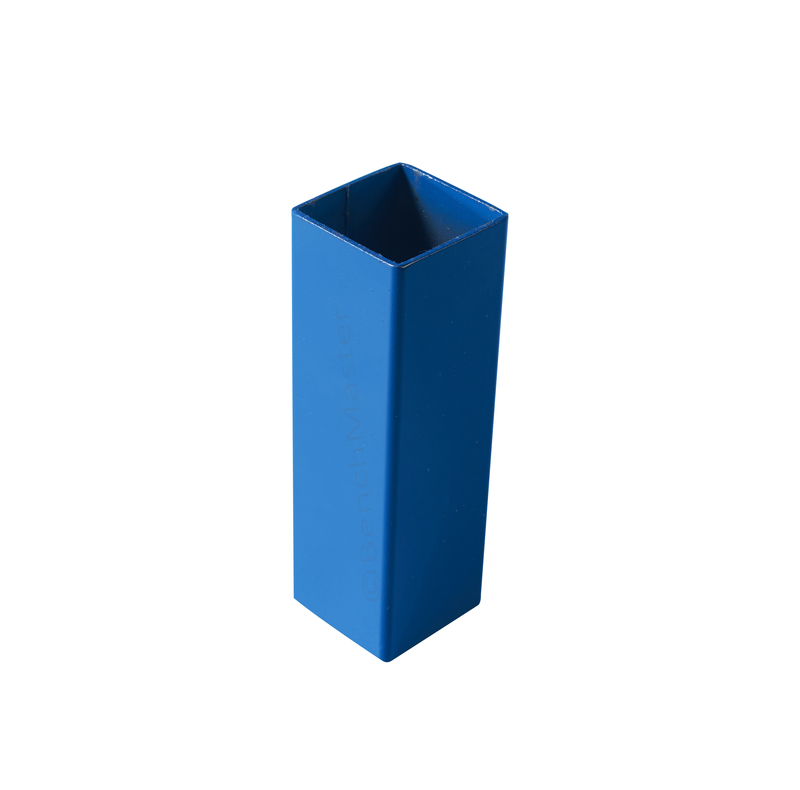 A: 38 x 38mm and 25 x 50mm hollow section. Q: Will my workbench support powered machinery? A: Our workbenches can be used to support machinery assuming it is within the UDL weight limit of the workbench. Please note the vibration of machines sometimes make it necessary, depending on the weight of the machine and the amount of vibration, to reduce the specified UDL of a workbench. Powered machinery must not be used on a steel topped only workbench. All powered machinery must only be located either on a 45mm solid wood worktop or a steel worktop on top of 45mm solid wood. If in doubt please contact us. Q: Why is my new cupboard/drawer a different colour from the last one I ordered? A: The standard colour of our medium duty cupboards, drawers and units were changed in July 2016. Q: Are other colours available? Q: Do BenchMaster do other colours than blue? Q: What is the standard colour on my workbench? Q: When I order a specific size of workbench how exact will it be to dimensions? A1: The main dimensions of length x depth x height can have a tolerance of up to plus or minus 5mm. A2: Wood / wood steel top heavy duty benches, the tops have an overhang of 10mm on all 4 sides. So if you placed an order for 2000mm long x 750mm deep the finished size would be approximately 2020mm x 770mm. Q: What are the dimensions of the light rail? Q: Are alternate workbench dimensions available? A: Yes but can add to price so please contact us on 01457 837146. Q: Can standard height be varied? A: Yes and at no extra cost but must be noted on your order. If you require special heights on packing workbenches, please check with us on 01457 837146. Q: What is the standard height of the workbenches? A: The standard height is 840mm apart from the packing workbenches where the standard height is 900mm. Q: What is the carriage cost? Carriage is included in our prices for all standard workbenches to most UK mainland destinations. For highlands and islands we charge a contribution of £50 per item. However in some instances this can be more. For items under £150.00 a carriage charge of £17.50 + VAT per item will apply. Q: Can you give me an estimated delivery time? A: All of our products are delivered using external couriers, so we could only give you a potential day. However if you want a call from the local courier on the day, please request a ‘book service’ when placing your order and we will arrange for you to receive a call regarding your delivery. Q: Can I request a delivery time? A: It is not currently possible to set a specific delivery time. However if there is an issue please speak with us. It is possible with third party carriers to ask their local depot to contact you and try and arrange an AM or PM delivery on a day to suit. Q: Do you deliver at weekends? Q: Do you deliver outside of the UK or a non-UK mainland address? A: Yes, delivery costs will be worked out on an individual basis. Q: Can BenchMaster deliver my order to a different address from the one listed on my invoice? A: Yes, please let us know at the time of order and if possible provide a contact name and number for the person who will be taking delivery of the product(s). Q: How long does it take to deliver a workbench? A: Our target is within 10 working days from receipt of order but please note this can vary depending on the current volume of orders. Q: Are there any restrictions on a delivery? A1: Typically your order will be delivered on a vehicle with a single driver. A2: The courier companies will not carry orders upstairs or use a lift. A3: Deliveries are a ‘kerb side’ delivery, which means the driver is not authorised to carry our products up or down steps or through a building. A4: The driver will not remove packaging or take it away. 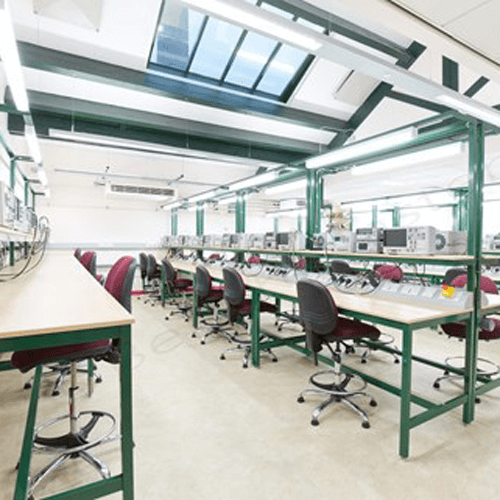 Q: What is the load capacity of the static workbenches? Q: Is 450kg the maximum carrying capacity on mobile workbenches and tool trolleys? A: The standard castors fitted are a set of two swivel braked and two swivel braked castors that carry a maximum load of 450kg. If however a heavier carrying capacity is required, please speak with us as heavier duty castors can be offered once we know the specific requirement. Q: Do BenchMaster prices include VAT? A: There is an option to select VAT in the top right hand side. Alternatively you can select do not include VAT. VAT is shown at the prevailing rate at the time of order. Q: Will BenchMaster review their prices if products are found cheaper elsewhere? A: BenchMaster work at offering what we believe is competitive pricing. If you do find a cheaper price elsewhere, please contact us and we will gladly look at our costs to see if we can offer a more competitive price for an identical item. Q: Do BenchMaster offer a discount? A: BenchMaster will consider discount on multiple orders. Each case is different, so please contact us on 01457 837146 or email sales@benchmaster.uk and let us know geographically where you would like us to deliver. We will then look at our costs (particularly carriage) and offer a discount to reduce your overall purchase price. a) Browse the product range and choose the one that suits you and add to your shopping basket. b) Choose and select from our comprehensive range of accessories and add to your shopping basket. Please check specific accessories selected will fit within the length of your workbench. If you are unsure, please call us on 01457 837146 or email sales@benchmaster.uk. c) Once you are happy with your order click on the ‘shopping basket’ located at the top of the page and check your order, add any additional comments including delivery instructions and proceed to check out. d) Confirm your contact details, billing and delivery address and select your payment method. e) Complete your order based on the selected payment method you requested and accept our terms and conditions. A: Yes, simply call us on 01457 837146. Our friendly staff will be able to help and advise you on any particular questions or if you are unsure about what you want to order. Q: Can I order by sending an email? A: If you prefer to order via email, simply email sales@benchmaster.uk. We target ourselves to answer emails within 24 hours of the initial request. Q: Can I pay by card? A: Yes, debit and most credit card payments are welcome online or over the phone. We currently don’t charge for using a credit card. Q: Can I have a proforma invoice? A: Yes, there are a number of ways to request a proforma invoice. Simply select ‘Proforma Invoice’ for your preferred payment method at the checkout, email sales@benchmaster.uk or call us on 01457 837146. Q: Are my payment details secure when making a payment on your site? A: On large value orders (£10,000 +) BenchMaster seek a deposit + stage payments. For more details, please contact us.